Cyprus Property Blog by Cleo : New on the Market - Beautifully Refurbished Bungalow in Kato Paphos with Title Deeds - NOW SOLD! • 69 sq. m., 1 bath, 2 bdrm bungalow - €129,000 EUR - Title Deeds - NOW SOLD! 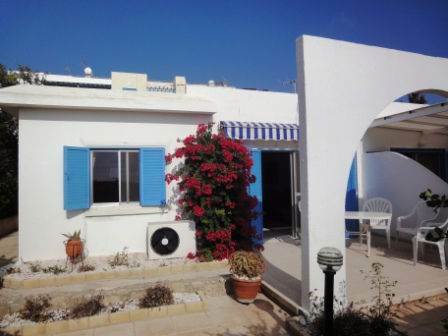 Kato Paphos, Cyprus - This semi-detached bungalow is located in the Tomb of the Kings area of Paphos, within walking distance to a wide range of shops, bars and restaurants, and the main bus route between Paphos and Coral Bay. The property has been refurbished to a high standard and features a spacious lounge with fitted shelving and corner storage cupboard. Patio doors open onto a private veranda and garden area, ideal for outdoor dining. A fitted sun awning provides shade when required. The impressive kitchen is separate and has an arch window to the living room with built-in breakfast bar. It is well equipped with a large electric hob, stainless steel cooker hood, under cupboard lighting and spotlights above the sink, built-in tower oven, an integrated fridge freezer, washing machine and dishwasher. A dryer is housed in a shed at the side of the property. Off the living room is a hallway leading to two large double bedrooms, one with fitted wardrobes with sliding doors, and the other with free standing wardrobes. The modern bathroom has a luxury double size shower, fitted mirror, storage cupboard and heated towel rail. There is a large communal pool with thatched umbrellas and sunbeds surrounding, and plenty of parking space.